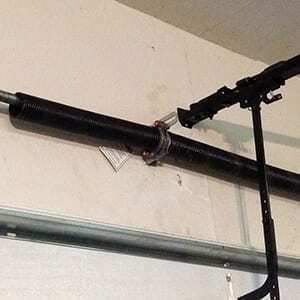 If you are thinking of performing your own garage door spring replacement, don’t. The risk of injury is simply too great. In addition, you could easily make a mistake that could do so much damage that you’d need a completely new door. Make the safe, smart choice and call a professional with Action Garage Door instead. There are two different kinds of springs used in garage doors, torsion and extension. Torsion springs secure the top of the door when it closes, while extension springs are used on the upper portion of the tracks on each side of the door. If either type breaks, the results can be extremely dangerous. The springs are very tightly wound in order to create the right amount of tension needed to lift the door. If one snaps, it can do a great deal of damage and cause a potentially life-threatening injury. If your springs are making a squeaking noise, you may only need to lubricate them rather than have garage door spring replacement performed. Just make sure you don’t touch the springs while doing so. If lubrication doesn’t work, you need to get in touch with a professional because that probably means your door has a serious problem. We bring the right tools and equipment so that we cut the correct size of springs. We install the springs correctly with the exact amount of tension that’s needed. Our technicians know how to install springs in the safest manner possible. We make sure the door is in the correct balance. We correctly wind torsion springs so that your door is as safe as possible. Again, we cannot stress enough the fact that garage door spring replacement is not the type of work that a novice can perform. Doors can weigh as much as 500 pounds, and as a result springs are under a great deal of pressure. If one whips into your body it can do a great deal of damage. Take that risk out of the equation by calling Action Garage Door at one of the numbers you see at the top of the page. Or, you can contact us online to schedule an appointment.